Excellent, Charlie has mastered the “down” Portion, Stay and waits for the “eat” command. Fetch was already down pat, but now she has mastered the “drop” command ! I’m ecstatic. Lol Charlie can play fetch for 5 hours straight so I love the throw stick :)…., my husband said he loves her on the couch ….but we have mastered the “down” command as sometimes she can be a tad overbearing. No visitors as yet…so will still get to practice when we do get visitors. I did a taster day on the Explosives dog course and a day on the Drug detection course, both were very enjoyable. I realised how much I have learnt from yourself and Chris while there as even though a lot of it was beginner/basic elements I already had as good an understanding as the people on the course and they are all already qualified dog handlers either through the army/police or private (so that was nice). Please express our thanks to everyone at SADTC for supporting the Highveld Belgian Shepherd Doc Club Open show on Sunday. We appreciate the support and look forward to seeing many of the competitors back in the ring in future shows. Well done to SADTC who did exceptionally well at the show once again. I heroically resisted this onslaught until I felt that she was old enough to take responsibility for a dog’s well being. Then the hard part, which type of dog will be suitable for us? 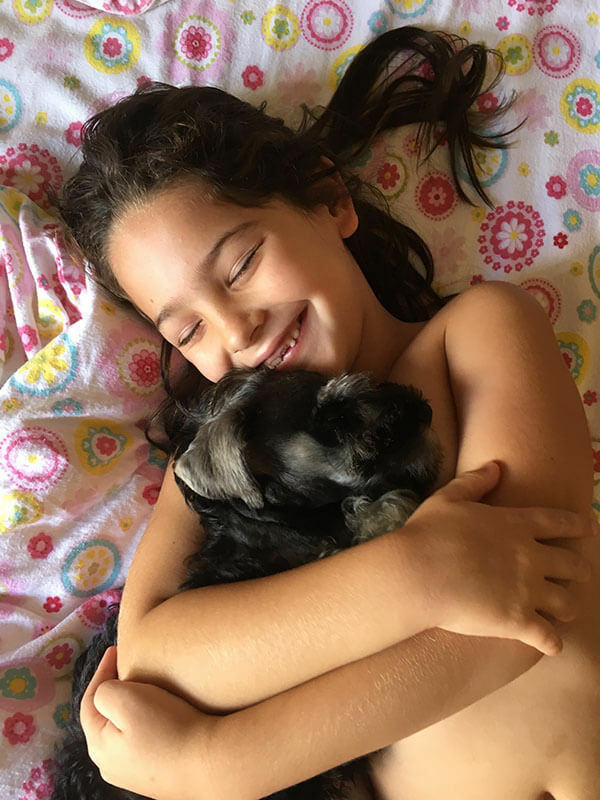 I wanted to give Alexia the same magical connection that can only exist between a child and their dog. As she is an only child this dog will have various roles to fulfil – best friend, brother, playmate and protector. This was quite a tall order! To make a very long story short, a friend of mine took in a rescue schnauzer and over a cup of coffee I fell head over heels in love with this awkward looking, bearded lady called Lily. 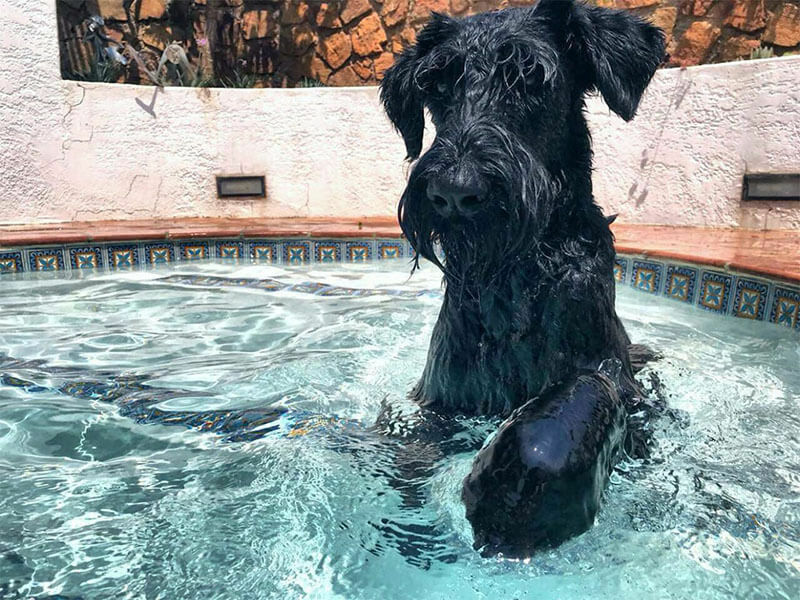 I have never even seen a schnauzer, new nothing of the breed but the personality I glimpsed that fateful afternoon sent me into a flurry of research. The more I learnt the more I was convinced that this is the dog I’ve been looking for and about a year later when Alexia turned 7 I brought Elliot home. And O! the joy.. I do not think that I will ever be able to top that moment for my child. The wonder and love that this scruffy, fluffy being has brought to both our lives cannot be explained to someone that has never experienced a dog’s love and devotion. And that lead me straight to SADTC (thank goodness) and as I never trained a dog before it was literally the blind leading the blind in this case, both myself and Elliot were equally clueless. Training me proved to be the more difficult part of the arrangement! Elliot quickly figured out that if he can decipher what the big, bearded man talking in a squeaky voice wants, he gets some really premium treats as reward… and so Chris instilled the philosophy in Elliot of “I work for food”. Chris, with the patience of Job and an endless supply of love for his furry charges proceeded to lead us through the growing pains of not only basic commands but also how to socialise safely among a hundred other things. Getting on board with the program I bribed Elliot through his puppy classes, proceeded to Sandra’s class (in the big open space outside the safety of the fence:), survived Keith’s super energetic classes, had a super chilled run in Mark’s class, enjoyed the dignified wisdom Oom Johan imparted on us, moved on to John’s classes that was a joy every Saturday and now we are full circle back in Sandra’s class which feels like coming home. It is only now that I’m writing this that I grasp the long way that we have come. And all throughout we were encouraged and guided (me), given treats and scratches (Elliot) and generally just being absorbed into a feeling of community where we are regular fools and shining stars all in one day.. and even being the “mini” in his class filled with big dogs we feel like we belong and can achieve more than what I could comprehend when we started this journey. Elliot has an abundance of love that he will lavish on anyone in close proximity but most of all he has that mad love a dog has for his human – Alexia. I was lucky enough to get the perfect breed for myself and Alexia, but I have all the instructors at SADTC to thank for the well adjusted, sociable and confident little boy he is today. I’m loving the journey that we are on at the moment and cannot wait to see what this year has in store for us! I was very nervous, because it was my first class with Johan. But his way of training is remarkable. He is excellent, on the other hand your school is excellent!!! I must say thank you to you guys for seeing my dogs potential and moving me up! Clearly this shows you guys are truly honest and not doing this just for the money… because other people would rather keep us in puppy class for a long time so they can make alot of money. Thanks once again. Hope you have a blessed week! Hi, I reached your premises, loaded off my dog and went to stand near a tree near the parking area and oh my God I couldn’t believe my eyes and ears. I had Biata and a friend walk up to me, knowing my name and my dogs name, introduced themselves to my dog and I, making me feel so so comfortable and so at home, just so at ease. Talking, asking questions, sharing some of there remarkable knowledge. They both helped out with my dog, once he was nice and calm they carried on and I decided to walk onto the field. Immediately a gentleman walked towards me, also a trainer (didn’t get his name)but he knew mine, also greeting myself and my dog by our names, checking out my dog, making sure I’m ok with “handling” my dog and sharing his knowledge with me a swell and that was AMAZING!!! The warm and welcoming feeling from the 2 ladies and the gentleman was AMAZING, the way they do things, the explanations and the eagerness to help was truly something amazing. I am so so happy that my husband pushed me to attend the first class or I would of been missing out on so much more. When the class was done, I didn’t even wait to drive back home to inform my husband, I immediately called him from SADTC parking area and told him of the great experience I just had, I told him how good they treated me and how professional they are and was happy to drive back home, the minute I reached home I repeated how happy I was and how amazing those 3 people were and he burst out laughing saying you phoned me to tell me this and you really repeating again you clearly are very happy! I must say, I have been to a lot of training but this is the BEST, if your dog trains here you have really done your best to give your dog the best! I will continue at SADTC it is a great amazing place with very nice people! Biata, her friend and the gentleman thank you to the 3 of you for making our training there so grate and for welcoming us so nicely also thank you for the loads of help and knowledge shared with me the hours before training started!! 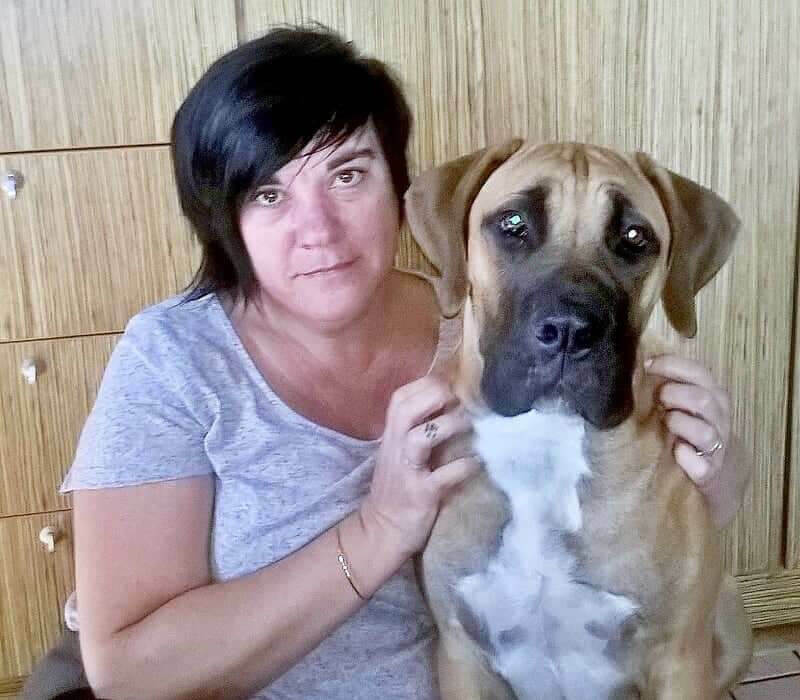 In December 2017 we were devastated when we sadly lost our much-loved male Boerboel, Blade, to Spirocerca Lupi. His absence left a big gap in our lives and after dropping many hints with my husband about getting a smaller breed puppy, such as a PUG, he surprised me one day by bringing home what I now realise has become my new furry BFF. 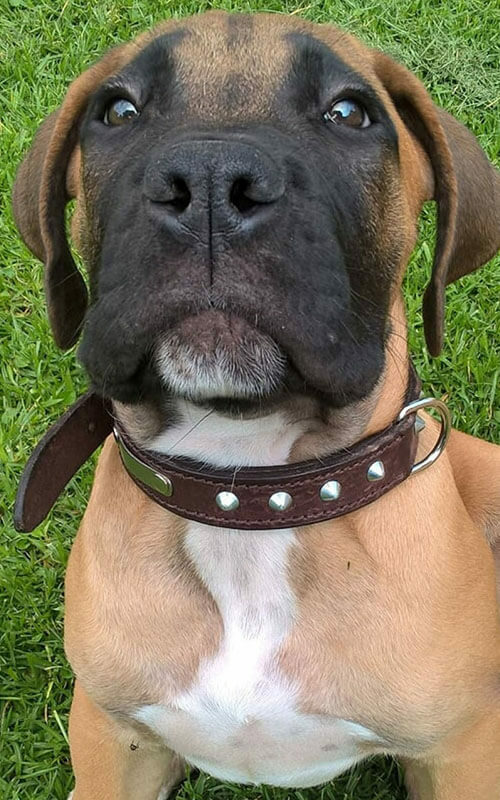 1 year, 50kgs of growth, buckets full of slobber, 4 pairs of shoes and plenty of torn washing later, I can’t imagine my life without him. As a kid, I did a bit of dog training with my Dad and our Bullterriers, and I remember how it used put me on a natural high. I live pretty close to Walkerville, and have often driven past the SADTC grounds and looked in longing for the opportunity to train a dog from puppyhood. My own kids have finished school and recently started working/studying, so in an attempt to side-step any feelings of empty-nest syndrome, as soon as Zeus had his final puppy inoculation, I knew exactly where I would be able to spend my time and reignite my love of dog training. Zeus and I started in the puppy class with Chris and after just a few weeks I was hooked. We are both equally excited to get our Saturday morning fix, albeit that I think he has seriously outgrown my two-seater MX5! Looking back, I realise that these early puppy classes which included socialisation, moulded his amazing nature with kids and other dogs. The proof of which is his Canine Good Citizen award in November. 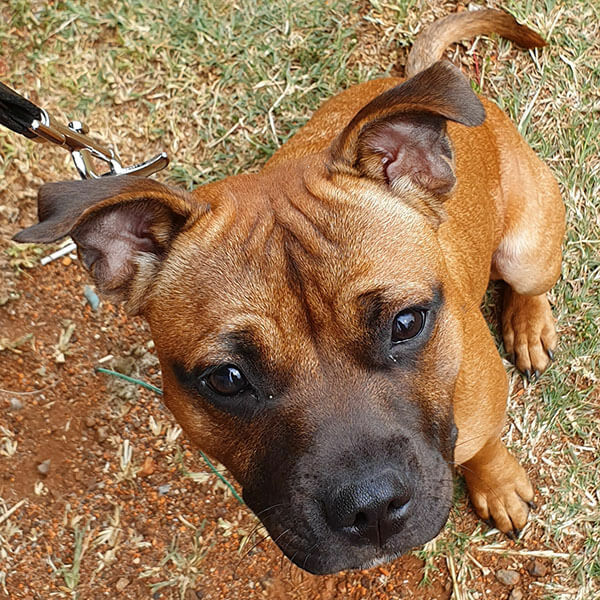 Over the months we have progressed up the rungs and currently we participate in Basic Home Obedience with John, and Agility Training with Mark and Lorna. This year we look forward to a new class – Protection Work, and although I am a little nervous of Zeus’s strength, I know that I am in good hands with SADTC. 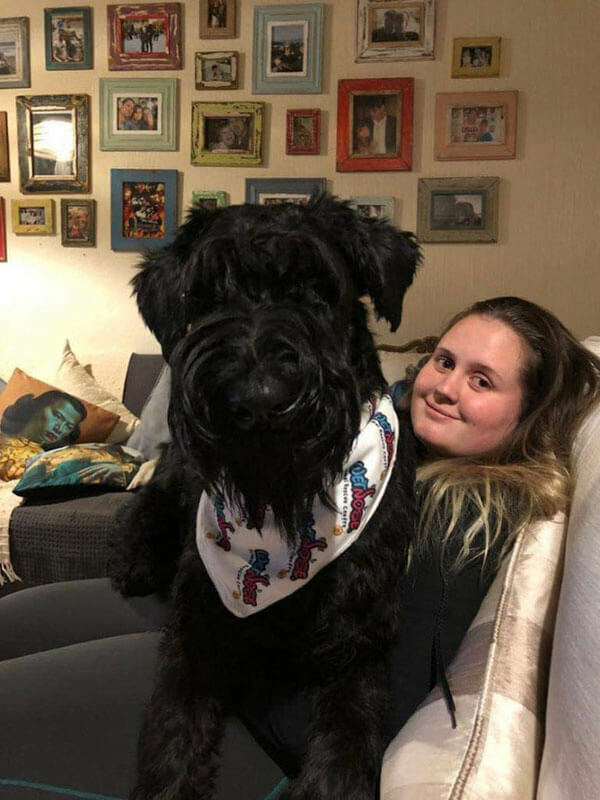 I have learnt that training deeply strengthens the bond between you and your dog, and I’m still learning that size means nothing if you use your voice. I have registered to attend the Level 1 Instructor Course in March and simply cannot wait to learn even more! I thoroughly enjoyed my first lesson with Chris. I’ve been practicing with Kai and he’s coming on nicely. I’m really looking forward to Saturday’s. Could I please hassle you for the instructors course information? Yes, instructors are all amazing and inspiring. I was Extremely satisfied with the training, and Chris, is Great and Very Knowledgeable. Little Senna, was Petrified before coming to You, and within the very first lessons, He was is Different Dog, so Yes! It Certainly it is Very Important to get the Puppies to Your Lessons. To All the Team, Keep Up the Great Work! Rowan and I really enjoyed our first class. Chris was really great and so easy to work with. I think it was all very exciting for them as they slept very well after we got home. Looking forward to next week’s class. Hallo, yes Leo and I enjoyed it very much. We are extremely happy with our trainer Biata. Will be back for more. Just need to teach him and me a few tricks this week. Our instructor is Chris, Yes he is brilliant. Thanks for a lovely establishment. Mark is really an awesome person. Very happy. Must say today homework was better than yesterday so hopefully by Saturday we will be a bit further. Our first lesson was wonderful. It didn’t take long for Rylee to become comfortable with a strange environment. Our instructor was Biata. She is absolutely amazing. Thank you so much for the great lesson and warm welcome. We had a super 1st training session. Dogs were mostly relaxed – and seemed to be a good group together. Chris was relaxed but firm – and the puppies responded well to him. We are so glad we have been able to come back to you guys to train our second schnauzer! Wow! I can’t believe our Colin is dog of month! Thank you so much! Our journey with Colin has been filled with tears, laughs, frustration, games, but mostly lots and lots of love. We decided to get Colin for protection reasons as my dad, Warren, travels often for business. We had never really had a big dog before and had no idea what we were actually getting ourselves into. Those of you who know Colin, will know that, although he is super cute, he can also be quite the handful. After about 2 weeks of having Colin, 3 T.V remotes, a pair of Nike running shoes, sunglasses, a handbag strap and the dustbin lid, we knew that we had to get him into training, and FAST! My dad being who he is, and an extensive researcher, was determined to find the best training school for Colin. 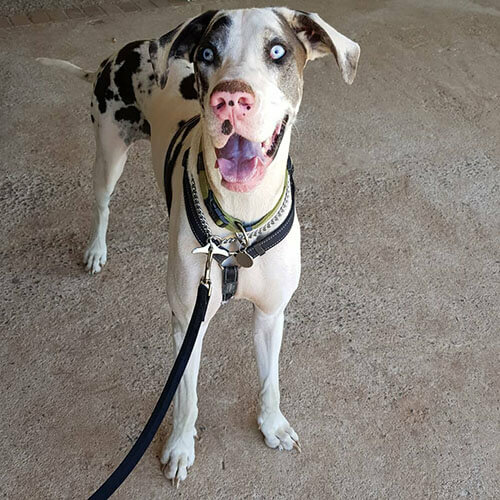 We wanted a training school that first and foremost, loved animals and focused on cruelty-free methods, as well as offered both Obedience and Protection work. And we found so much more than that at SADTC! In the beginning, Colin was really difficult and pulled me off of my feet numerous times. After about what felt like the 800th time being pulled off my feet by Colin, we decided that it’s best if my dad became his handler at training, and I practice with him at home. Since then, Colin has come a long way. He even won his Obedience competition!! 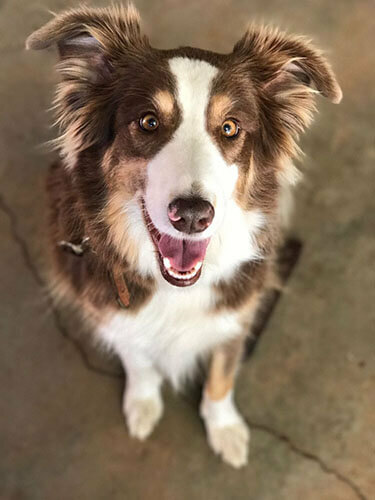 (This was a huge surprise victory in our house – my dad even wanted to replace Colin’s certificate with my graduation photo…) He has started to settle down at training and has become quite popular, especially in his agility class. We are even able to take him to the park and let him run off leash without worrying about pandemonium breaking out. We are so proud of Colin, and so thankful for SADTC and all of Colin’s instructors for all their help, support and guidance. Although we have only had our Colin for little over a year, he is such an important part of our family (as are any of our animals). He enjoys going on walks, driving in the car and simply going places with us. He loves being around people and LOVES being the centre of attention. He is filled with personality and is super intelligent, constantly trying to outsmart us. 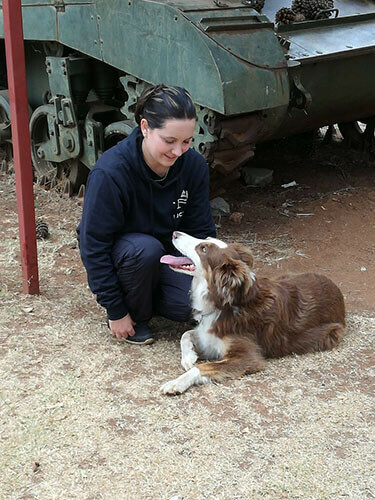 We are so grateful to everyone at SADTC for helping us get through the difficult phase of Colin’s training but also cheering us on now, and for always giving us the best advise! We have learnt so much about our furry friends, and have also made so many new friends that we will never forget!! What a humbling yet exciting privilege it is for Lucy to be nominated as dog of the month. Our story is a journey of dedication, perseverance and overcoming individual obstacles, fears and difficulties. Our story starts at chapter 1 as usual but with a twist. My dad was invited to take a puppy from a litter of x border collie pups. Mom a working dog on a plot nearby. We were told that they are getting rid of the pups, one way or the other (if you know what I mean) So Dad decided to get the little red one. We were told that she is 8 weeks old. But from pics included and education I now know she was taken at a very young age. She didn’t get any imprinting a young pup needs. But little did we know these things. We took her home and that is how the journey starts with my Dad as her owner. Seeing dogs at wodac doing some agility and other exercises, I finally convinced my dad that Lucy is a high energy dog and we need to train her. I started looking for some sort of training where I can teach dogs tricks like what they showed on Expresso that time. Which was 2015. I finally came across SADTC. (Where I enrolled for instructor course level 1 a little bit later.) I saw how awesome it looked to have a trained dog. Never training a dog in my life. We started Bho In April 2015. Realizing it is not as easy as it seems. What a nightmare. Lucy would not have a collar around her neck let alone the leash clipped on. She was as nervous as could be and lashed out to any dog near us. She was fearful to people and I literally had to carry her where I wanted her. Resulting in us standing far away from everyone and standing in the end of class line to avoid any nervousness. Words cannot explain how many times I wanted to give up. I was crying in most of the classes, either during or after or even both. But then after pressing through, Things started to change and Lucy chose me to be her caretaker. Now she is my dog. We could actually sit between people in the clubhouse provided the dogs do not make direct eye contact. Wow! We then did some socialization with some of the placid dogs at school. We waited till every one went home and under the watchful eye of Chris. We let the dogs out. I think I was more nervous than anything else. But it worked. Being the nervous dog that Lucy is, we decided to build some confidence. She would not tolerate me being more than 1 step away from her. They call it Velcro collie. Frustrating if you think of obedience recall, retrieve and most of all stays. We tried agility for a start. Starting with baby steps. First showing her that this thing will not hurt her or separate her from me. She loved it! Lucy was crawling out her shell and I decided to give other classes a go. We did detection for a while but she got bored to quick. One day we sat at clubhouse watching the protection work, and all of a sudden she jumps up and barks at the decoy. What was this? A border collie who wanted to be a police dog! So. We gave her a turn. Her second favorite class now. This built her confidence even more and I was able to take her out to parks and walks with no worries. We even did a fun day at Gilhooleys with dogs she did not know. Makes me so proud of her. Doing dog training with Lucy has not only been challenging in a training perspective but has been challenging personally as well. The two of us growing from 2 separate nervous wrecks, building and working at each other to become what we are today. More confident, more educated and ready to take on any challenge. 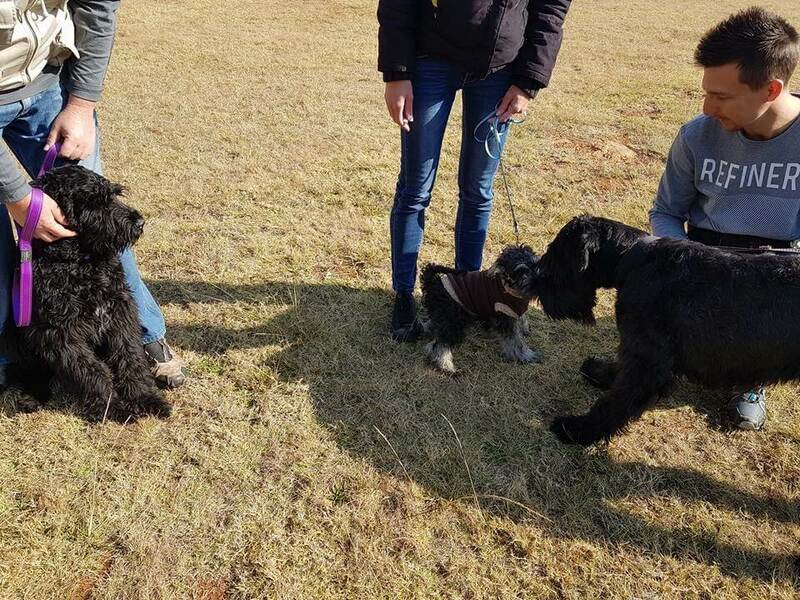 Being able to walk on and off leash, walking between dogs at clubhouse, greeting certain dogs and people this is what Our Sadtc family helped us achieve. I am tremendously proud of my little girl Lucy. Changing my life for the better. I would always be grateful for your sloppy kisses and your hair al over my clothes and bed. With all the challenges we have to face I could not imagine it without you my little therapist. Listening to me when I’m sad and bringing the ball so we can go and play and forget about life for a while. We achieved so much together. 4 years of blood, sweat and lots of tears. She might not be an obedience champ. But she is my champ! Loving agility and protection work like she was born for it. I love spending my time with her doing fun stuff or just chilling. I learned that border collies are very versatile contrary to popular belief that they are only herding dogs. They make great detection dogs, and really good companions given that you meet their high energy level needs. They have a way of giving you a certain look, or bark and you better start throwing the ball or there’s trouble. The collie stare is one of their trademarks and they use it wisely. So be warned, they can get you to do anything. Finally Getting our awards this year for 1st in advance agility. Was beyond amazing and shows what hard work and perseverance can achieve. In Afrikaans there is a saying : AANHOUER WEN! Thank you to all the amazing instructors and friends at SADTC for all the help support and education we received. Lucy also received best all rounder for the year thanks to all who did not give up on us. SADTC is more than a dog school. It’s a support system where friends become family. I love you all. Volde, short for Voldemort, came through for a private lesson. He is an extreme busy body and gets distracted very easily. His handler wanted some tips on keeping him focused and attentive. We worked on this and homework was given. We will see his progress in January. This beautiful girl is Matilda. She came through for a private lesson as her owner recently took a tumble while out walking her and then got a bit nervous to take her out on a walk again, and had someone else walking her instead. We changed up some of the equipment being used and gave the handler the necessary skills and confidence to take Matilda out for more walks. They were both very happy by the end of the lesson and the owner committed to taking Matilda for a walk that evening. This handsome fellow came to us this week for a private lesson. He had been trained at another club but they weren’t sure what to do about his ‘aggression’ issues. We made some changes to the equipment being used on him. Then we worked on his obedience to start. We showed his owners some tips on how to keep him focused. He picked this up really quickly. Lastly we worked on his reactions towards other dogs. He was worked initially by our instructor, so that the owners could see how to work with him in those situations. Then it was their turn. By the end of the session he was behaving like a champion. This boy is not aggressive in the slightest, he is just being an inquisitive boy. His owners now know what they are dealing with and how to handle him when he reacts. I think we gained more knowledge in the 1 lesson from you than what we did in 3 months on the “other” side. It was great. Much appreciated. This man, Jerry Selwane, is very special to SADTC. He came out one night about 7 years ago to help with a dog that been hit by a car. 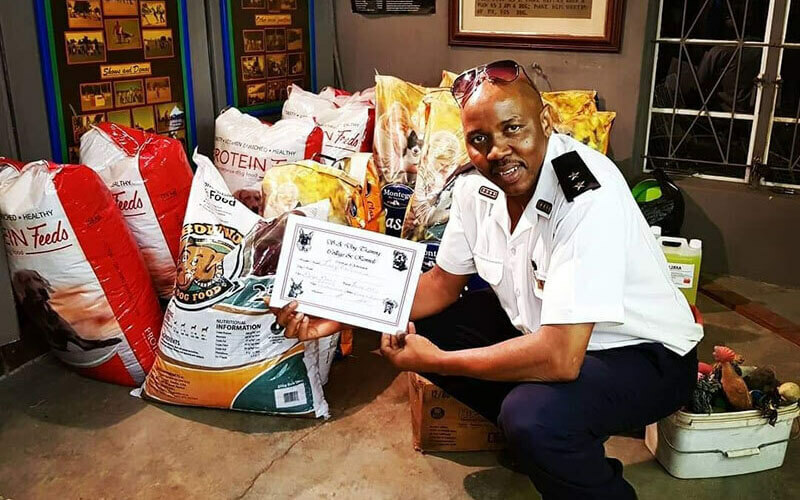 We wanted to give something back, to the only man willing to help that evening, so we sponsored him the SADTC Level 1 Instructor’s Course and then one of our members sponsored his level 2 and 3 courses. He is now a very busy man, helping animals and educating people. We had our awards evening last night and collected (along with Honeydew Equestrian Centre) some things for the rescue Jerry runs, SARAC. 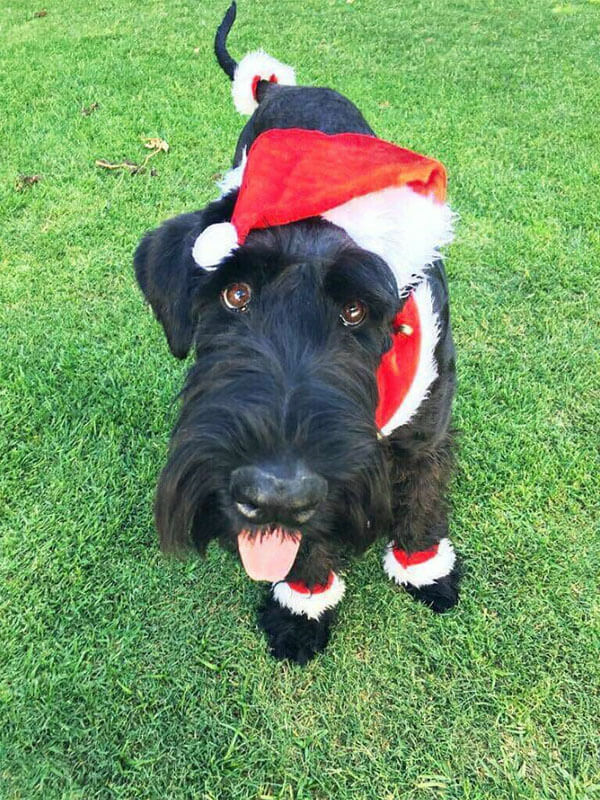 Wishing the dogs at the centre a very good Christmas and hoping you all find homes soon. 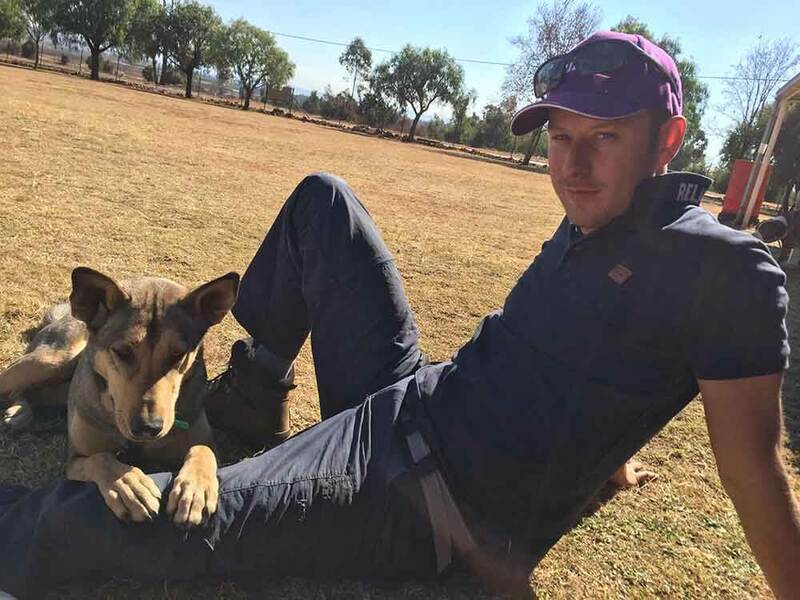 “We at SARAC wish to convey our sincere gratitude to Biata Hodges and everyone at SADTC for the love and generosity towards our shelter. On the average day we stare into the desperate faces of dozens of hungry, ill and malnourished animals. The pressure to assist and intervene is all too often overwhelming, but it is simply not always possible due to our heavily constrained resources. Out of all the dog schools I have been in discussion with, the SADTC is by far superior in feedback, passion and willingness to help. A bond between man and dog is unbelievable and unbreakable, but a bond between a family and their dog has nothing to compare too. Oden has been the centre of our world since he came home and the amount of love we have for him is unexplainable. One of the biggest issues we had is the dog training, on one hand mom would spoil and let Oden get away with the bratty things all dogs love to do, while myself would try more to enforce discipline and obedience. 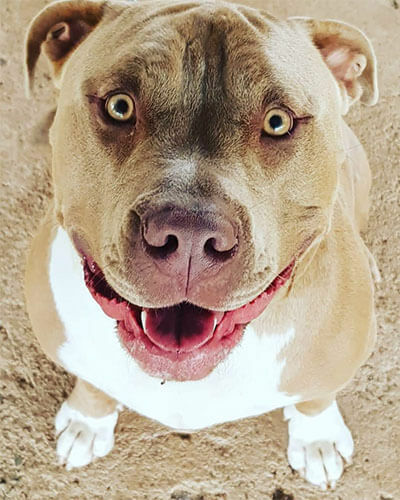 Hence came in the search for a dog training school, we called multiple schools, and received many disappointing answers like we don’t accept ‘Pitbull breeds’ or what is an American Bully, with this came doubt that they would understand his breed and not treat him correctly because of this. Then one day I came across SADTC, the email responses and communication was almost immediate and so full of exactly what we wanted to hear, a school that knew his breed, that was excited to meet him and us, and not only were they interested in training Oden , but explained why it was so important that us as parents needed to be trained too. On the first day of orientation, it was so cold we could hardly feel our ears! But with winter at its peak, we saw the warm smiles of people walking their dogs around the grounds and saw the determination of these humans and the happiness of their fur babies! Everyone looked like they belonged and it was a warm feeling to know we soon are going to part of this. The first day at dog training, were up at 6 already taking Oden for a walk because we knew exactly how much of excitement he can contain within, and as told by the school to try to be there a little earlier so we could walk him and get him accustomed to the environment, boy can I tell you the excitement he had every Saturday morning thereafter. We woke up early each Saturday with anticipation of learning more ways of understanding and loving our boy, we had amazing trainers who not just understood our boy but us as his owners too. They helped identify the mistakes we were making and gave great advise to prevent and rectify them. Oden has come so far since we started at SADTC, he’s more attentive, we learnt how to understand him and sense his reactions before he can act out, he’s much more obedient and well-mannered and we are so grateful for what we have gotten from the school. In the future, we hope to stay in obedience for as long as we can as well as up his skills to scent and protection training! Hi there Christine, family, colleagues and friends. We both made a fuss and he was quite chuffed with himself. Thank you everyone – especially Biata and Christine for all your love and kindness and gentleness you show us and our animals. Have a very blessed and safe festive season. Hello my name is Carl and my partner in crime is Casi. My dad was a police dog handler in the UK. As a result, I grew up in the company of German Shepherd (attack/protection dogs) and Labrador/Springer spaniel (drug detection dogs). I joined SADTC in March 2018. In September I completed Levels 1-3 of their Instructor course. It is certainly one of the best things I have done in my life. Starting off I had some knowledge of dogs and dog training, but the more I learned from them, the little I realised I knew. Witnessing their humane approach was my aha moment! A year ago I took over caring for my mum’s dog Casi (a German shepherd cross Labrador). At that point she was 4 years old and had basic obedience training. The last 7 months spent working with Casi have opened my eyes to the miracle that she is. She has clearly inherited the best from both breeds. A phenomenal dog, full of life and drive. Whether it be swimming, agility, protection or her favourite past time of chasing a ball over and over, her energy is ever present. Casi has taught me a lot about high drive dogs. Our short time together at SADTC has born much fruit. The improvement in both Casi and myself have been great. The most notable improvement being Casi’s ability to channel her energy effectively. Before the time spent together, Casi was the proverbial ‘bull in a china shop’. I look forward to our continuous improvement as we learn from each other and go from strength to strength. With the new insight gained from SADTC, I see that Casi and all dogs are capable of so much more than we understand they are. The family at SADTC is amazing and anyone wanting to get into dog training could not find a better place to go. There is no question to small or problem too big for Chris, Christine and all the instructors there. Just a short note to tell everybody how very proud we are of Sherri and Lexi! Lexi has done a 180 degree turn around through Sherri’s complete dedication and your invaluable coaching. She is now integrating all of our 6 cats with Lexi which until recently is something I did not think possible, especially in such a short time-frame! Went for our first lesson yesterday. Already received many helpful tips. Clean facilities, friendly training staff and my pup had a wonderful time. 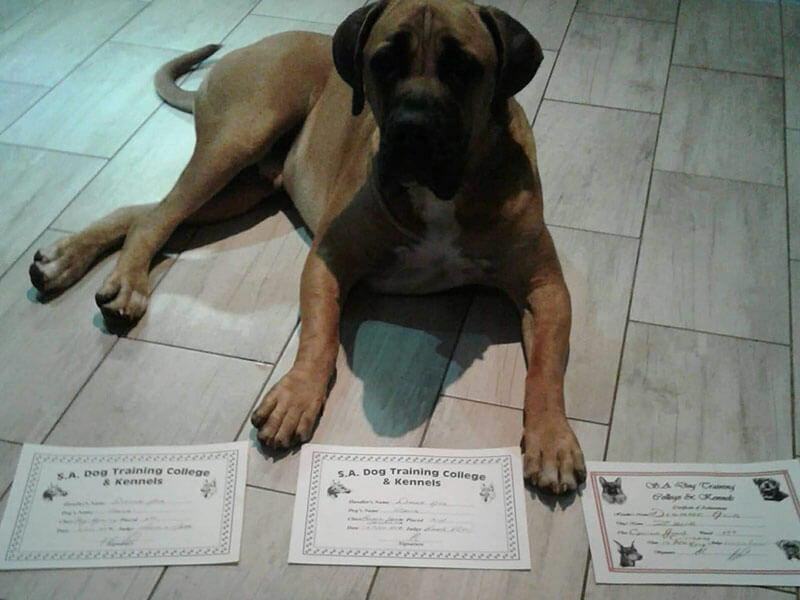 Check out SADTC, they train any breed of dog, I’ve been there for only four weeks now and already I have a huge improvement in my dogs behaviour. Really enjoyed today. Good time spent with my dogs, good people teaching, what more could one want, SADTC rocks. Zoe loves the school, so do I. Your daughter was pleased with all of us, our group has older dogs and they are settled and clever and eager, in my opinion. 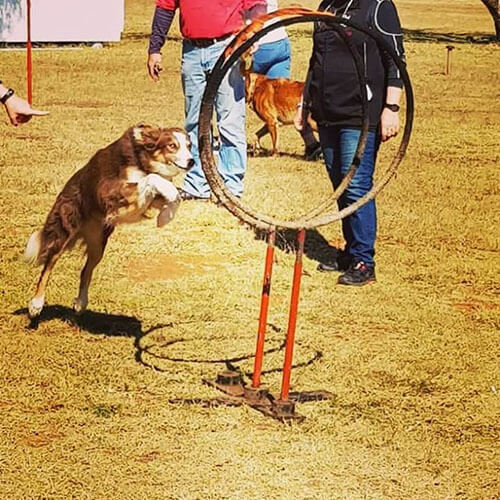 We started agility last weekend and Zoe did well. Impressed by professionalism and knowledge of the instructors. Enjoy the individual attention that each handler and dogs gets as well. My first lesson has already changed LouLou and myself dramatically. We have both just clicked and reading your booklet makes even more sense. Today I went for a walk at Rietvlei with LouLou & Matteo and it all worked out. Matteo(toddler) and myself are the ones who need the lesson’s as LouLou would honestly be in advanced training by now. So far the first lesson was good and informative and it reminded me a lot of things to remember going forward so I enjoyed it and I think my puppy did too. No complaints other than my dog that was not interested in being taught, just plonked himself down on the grass. Very impressed with how the instructor handled all the different dog and handler personalities, well done! The training was very good thanks. Much better than other places I’d been to previously. Chris gave a lot of helpful tips which I am trying to practice on. So far the experience has been both entertaining and informative – I enjoy your sense of humour and Gryffin LOVES your treats. I am really impressed with the training methods and how quickly Gryffin responds to the commands/signals – when he is not being lazy. We look forward to our next lesson and see you on Saturday! Over the last few weeks we have seen a huge improvement in our pups behavior and obedience, to add to that we also are made more aware of his behavior and way of communicating to us. The training is making a huge difference in our relationship from the first week and look forward to learning and gaining more from the course. We have also witnessed our wrong doings and upon correcting that have seen the difference in our pups behavior. Please extend our thanks to Christine for the special she gave me. I have thoroughly enjoyed my experience with SADTC and will certainly recommend all my friends to them. I would appreciate your keeping us on your communications list still, as we would still like to support the school in any functions/events that are held. We would like to take this opportunity to thank SADTC for all the help. We have seen an amazing improvement with Willow and Sandra has been a fantastic instructor. I would like to let you know that I will recommend SADTC to anyone in need of training. The behaviour shaping is going well. It’s taking a while but definitely improving, I am able to leave the house for about 15 minutes before he starts to stress. So I think it’s definitely getting better. When I get home he is still over excited but I just ignore him until he calms down. He seems to be calming down quicker. I have also been putting him outside for a bit even when I’m home so that he isn’t always following me around. Normally I would just leave the door open so he could come and go but he would always hang around me. At first he would stand at the door and cry but now he goes exploring for short while. I had thought that he would learn to be a bit more independent and that may help too? I am still working on it everyday so I think we will definitely get there. 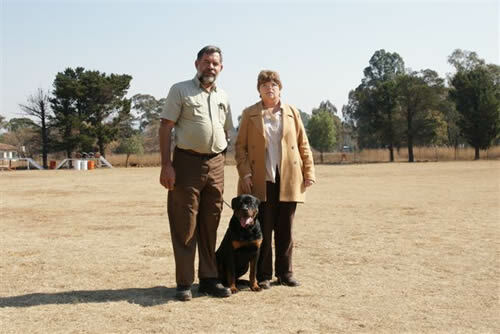 I would like to thank SADTC for the time we had with you doing the Basic Home Obedience Course. We had a wonderful time with you and wish that you were closer. Our almost 5 month old German Shepherd is trained in obedience. My wife had to drop our daughter off at 5 this morning so I told her to take the Misty (the dog) with as a safety measure. The rear seats were down so the boot and that space is nice and big and Misty lies down nicely. A traffic officer pulled my wife over and asked for her lisence and immediately asked if she has a weapon. 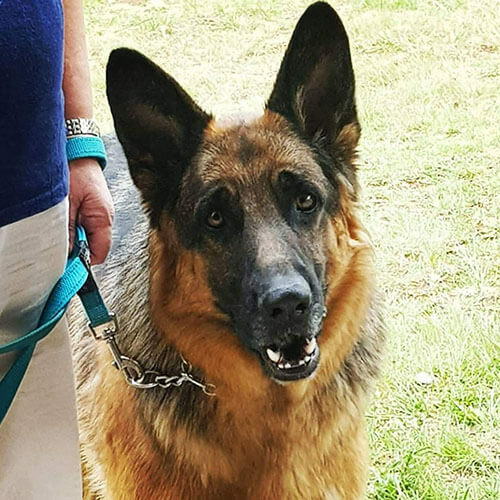 Before she could answer, Misty sat upright when she saw the officer and the officer moved to saying that it is illegal to transport a dog without being in a crate and that it is against the road regulations. She then said that there is no such law and he got arrogant, raising his voice asking ” who is the officer, me or you”? She replied being an officer does not automatically make your statement correct. He then made a sudden move toward the window and in a flash Misty was on my wife’s lap, muzzle halfway out the window (it was rolled down about 15cm? and she went full protection mode barking, growling and snarling at the officer! My wife then asked the officer if he is going to give her get lisence back, or is he going to follow her to the police station to resolve this matter? He then very carefully slipped the card through the window. As my wife drove off, she saw them making an ILLEGAL u-turn in the middle of an intersection and drive off. Asking for license with no greeting or checking the license disc in the window. Not planning on the GSD in the car. The training is going very well. I will send you video links. The tracking is going extremely good! Heads down moving at a pace that requires me to run a bit to get to the item so she can get her toy. Nova is very thorough, moving slowly, but directly on the trail keeping her head down. Misty runs at a pace switching between tracking and trailing, not necessarily moving on the spoor, but getting to her target as fast as possible. As for the poison prevention, it is going really well. If food falls out they either stops eating and move away until I place it back in their bowl, or continues to eat and leaves the food that fell out. I will be in touch for further lessons on protection. Thank you, we really enjoyed our training! Kindly note that we will be cancelling our Saturday classes due to it clashing with our honours schedule, we will however be looking at private classes for Chuck to keep the training going. Thank you so much for the excellent services provided! You guys are still our number 1 holiday home. Training is going well. I’m concentrating on Rasca and socialising. 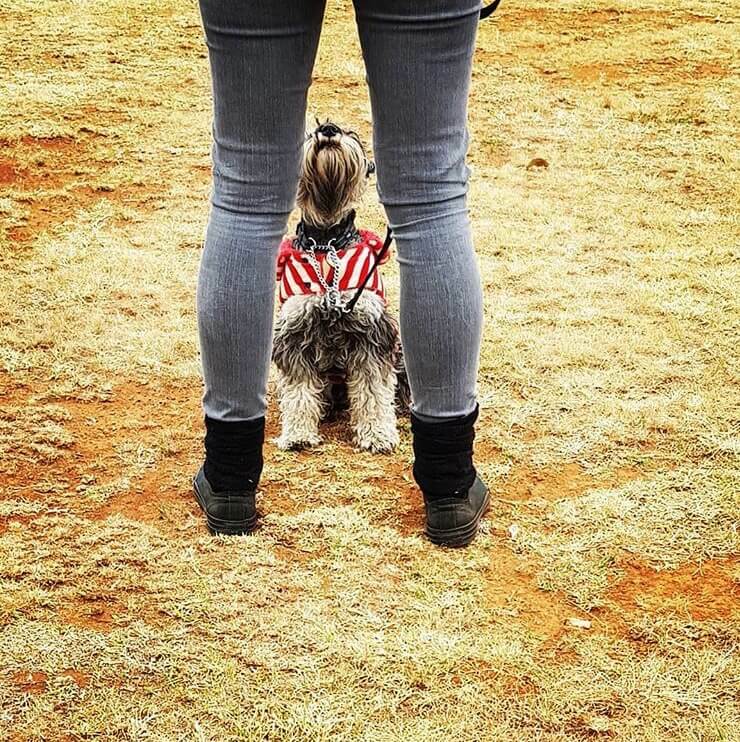 I walk with her and put her on sits when strangers pass by. She is doing much better–now I need to work on her lounging at cars. I take her to peoples homes and she does very well. 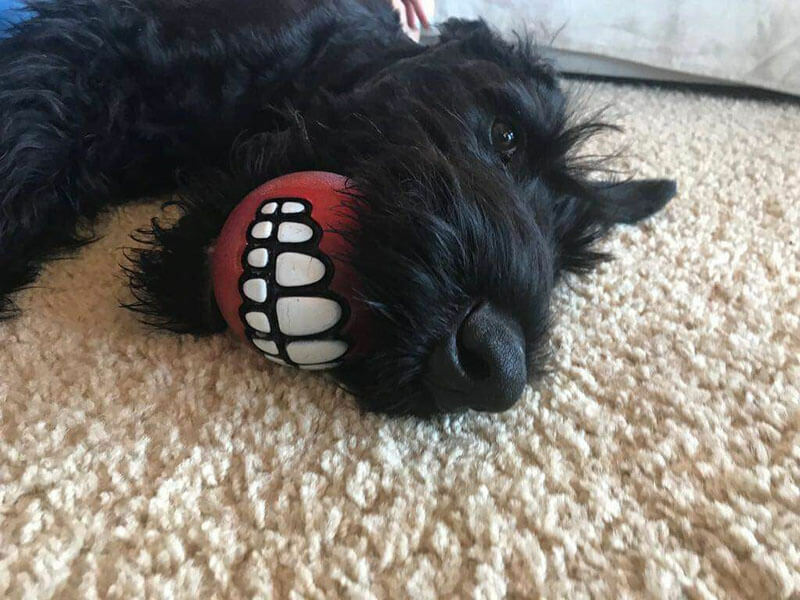 She is a different dog in other settings. Still weary but much less agressive. Maca is a saint, she does her commands very well. Rasca has a new trick now. She sits for cuddles, which is cute. I am slowly working with her on the jumping and im trying to be the pack leader. Much improved. Thanks a lot to you Chris and Christine for the training course Giselle and Jaco went on. The training is going very well he is listening to me more since I believe my attitude toward him has changed he is still very busy but reacts more positively to my commands. Cindy and I would like to thank you on behalf of Draco. 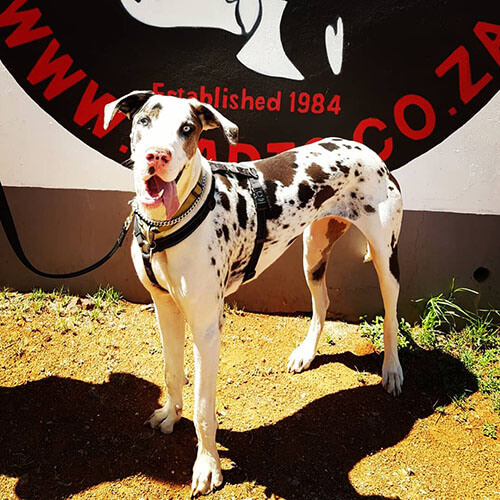 He thoroughly enjoyed his training sessions and playtime with his training mates and especially the bond he formed with the training staff of SADTC. Although he is missing training because his parents have to work away he will surely be back for further training. We would all like to sincerely thank you for the special memories and look forward to seeing you soon to resume the training. Teacher was awesome and really interesting – couldn’t fault anything. I did training with Tammy, last an I were very satisfied with her training. I will suggest any person to join your training. Peter and I have felt part of your “extended family” during the time we have trained Bella and Doughnut and will miss the times spent there. Nonetheless we believe that both Peter and I and our beloved dogs Bella and Doughnut have been the better for the experience. Thank you to all of you who have played a part in it. Please pass on our best wishes to everyone. Going much better thank you. Chris was awesome. Bacci & Paollino were both devious thieves who spent all day running around their owner’s massive property. The female Bacci was more excitable than the male. They both jumped up on visitors. They seemed to behave when the Manager of the farm was around, but when she was not there they were incredibly naughty. The female is very intelligent, but she distrusts humans immensely. The Manager stated that SADTC would understand dog psyche more than she would, and hoped that the dogs could be re-trained! 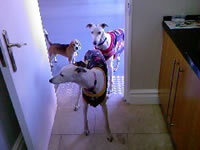 They were both treated to pretty new collars – Bacci has a bright pink, and Paollino with a bright blue one. I spend a good 10 minutes with them each day, although it’s not always obedience training, praising good behaviour, making them sit and lay down etc. They enjoy the interaction and almost do tricks just to try and please me! It’s great, and I am actually slowly starting to like them. I was just indifferent to them in the past. But now they greet me properly, with respect and are very calm. The greyhounds are doing very, very well. I have really bonded with them now and they treat me very respectfully. When they come to greet me, they turn around in front of me and sit or lie down without being asked. I think that is quite good, because it seems to me that they are settled. They do not hassle guests anymore, they play gently with Bella (the Beagle in the photo), and they have stopped stealing so much! When Peter went away on long term sick leave, another chap David took over the feeding duties, and the dogs also bonded with David. However, when Peter came back the dogs didn’t quite know what to do. But now they have actually spilt up (we were gob smacked!!! ), and the female, Bacci spends her whole day with David. Paolino has decided to stay with Peter. So for most of the day they are apart, which I think has benefited them greatly. Thank you so very much for the work that you and your family did with our dogs. It has made our lives easier, but their lives much nicer as well, as they interact properly with people now! It was of course you that set the ball rolling, so we are very grateful!!! Denzel, a stunning male Rottweiler of 9 months was a nightmare for the owners when he came in, he was destructive, not listening to commands, etc. He was also extremely strong for his age. We kept him with us for 2 weeks and the owners were thrilled when they collected him as he is now a well behaved member of the family. 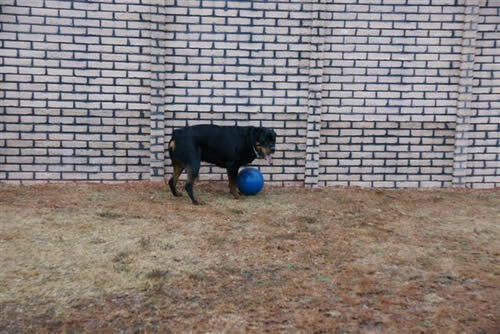 Diesel, a male Rottweiler was not at all keen on other dogs. Due to this people would also often avoid him as they were quite intimidated by his attitude and size. We worked with John, his owner, and Diesel, shaping behaviour and desensitising him to other dogs, etc. John and Diesel are now in the semi-advanced class and Diesel is a much more controlled, happier animal that is keen to work and not worry about the rest. People now comment on how great Diesel is working and what a different dog he is.